Nowadays, as we all know that people has started talking about the 3G internet packages details of Zong, Mobilink, Ufone and Telenor in all over the pakistan. I would like to remember you that we've published a special post for zong users to get know about all 3g internet packages for zong. And in this post, we will be sharing information & details about Ufone 3g internet packages in pakistan. As of our research on many websites like propakistani and others, we noticed that ufone has announced their 3G internet packages to be used in 3G supported mobile phone in pakistan. In this post you will find the details about the ufone 3g packages of internet. Ufone has launched three types of internet packages with different speeds i.e 256, 512 kbps and 1MBps named as U High speed, U Super Sonic and U Hypersonic and all had their Daily, Weekly and monthly internet bundles. Now we will be sharing the details of all the available bundles within different speeds for 3G ufone internet packages below. So dear friends! 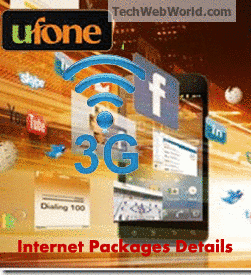 Above we had listed all of the 3G internet packages details about ufone. We tried our best to add confirmed and latest packages details and of our research, these are the correct details for ufone 3G internet packages. If not then please let us know in the comment box below so we will update the post with the correct!!! Also please share this post on your social networks i.e Facebook, twitter etc. We appreciate every comment related to this post! If you've anything in your mind then feel free to share it with us!!! Can anyone tell me about Ufone 3G package is available in Shikarpur ? Please dial *3344# to check if ufone 3G Coverage is available in your area or not.